Some people like to eat al fresco in the summer. For me, the perfect time to enjoy an outdoor picnic or dinner is when the air is crisp and comfortable. Fall is the best time to be outside, especially when the leaves are just beginning to turn! I’m ready to eat almost every meal outside on the patio. And when serving family and friends I like to make things easy here at StoneGable! And nothing’s easier than self serve! Today I set up a drink bar on my potting bench! My family and guests can help themselves to a drink and a little nibble while they are waiting for dinner. My garden is so full of brilliant colored marigold and zinnias this fall, they just had to be part of the drink bar. So I pulled many of my galvanized pieces and used accents of blue, green and orange to compliment the flowers! The effect is quaint, country and saturated with gorgeous color! Two garden bouquets found their homes in pitchers from my farmhouse kitchen. What would fall be without a pumpkin? Isn’t this little orange guy adorable! Golden Apple Punch is served from a large galvanized beverage dispenser from Birch Lane. I added a ring of faux fall foliage around the bottom of the glass for a fun fall look! The recipe for this yummy drink is at the bottom of the page. Look at these little vintage dairy bottles! Who could resist drinking punch from these through a straw? 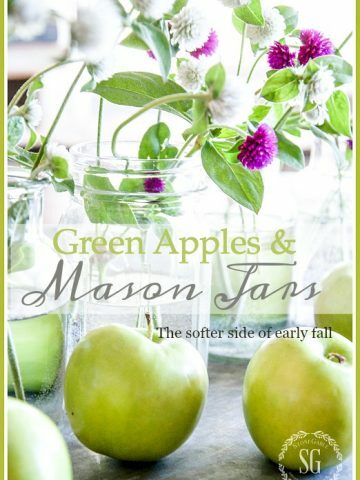 Did you notice the mason jars on the bottom shelf of the potting bench? 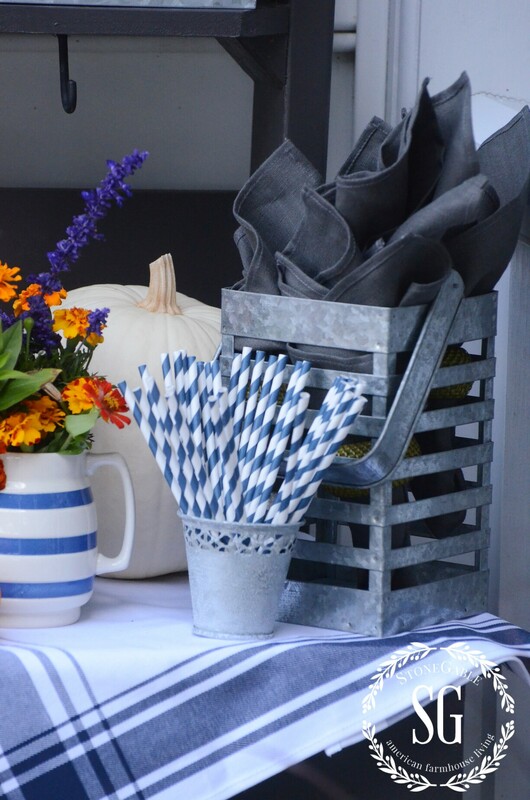 Mason jars and dairy bottles (Birch Lane) make outdoor dining simple and so enjoyable! The stashed away mason jars are for the sparkling water, sodas and wines chilling in a galvanized beverage tub with a stand from Birch Lane next to the potting bench! The drinks are icy cold! My vintage wash stand is taking on a fall look too! This summer it held a kitchen herb garden. Now only the hardiest of the herbs are left and happy mums have replaced the spent herbs. To see what they looked like this summer click HERE. I hope to put greens and maybe even a small evergreen tree in it at Christmas! A cut-out galvanized container holds the straws. Next to it, a large galvanized lantern corrals beautiful pewter colored napkins (Birch Lane) gathered up in green straw napkin rings. I love to think up interesting ways to present thing! Who knew that a lantern could be used to hold napkins? I covered the potting bench table with a couple of blue and white tea towels. The colors and the patterns are pure farmhouse inspiration! I’ve learned the importance of layer upon layer when styling a table or vignette! The tea towels bring a big splash of color and add a nice textural feel! And they really pop against the charcoal grey potting bench! While guests are getting their drinks they can take a handful of goodies! 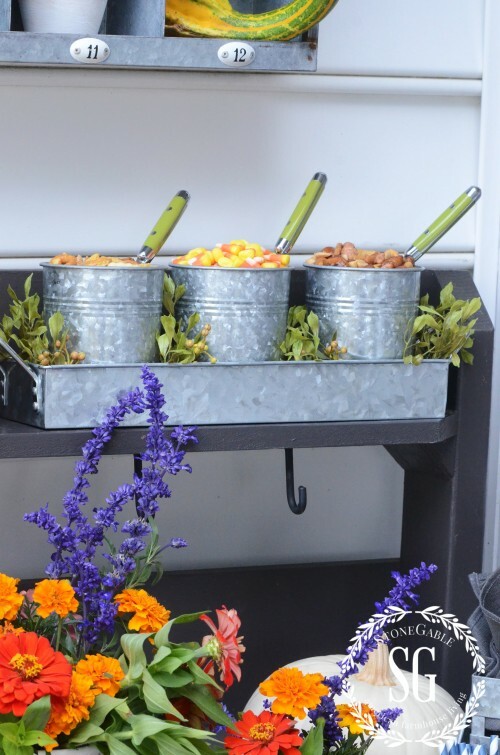 A galvanized utensil caddy (Birch Lane) works as a little snack station! Two savory nibbles and one sweet! Just the right amount so no one will ruin their appetite. And yes, one IS candy corn! I find that serving a little snack by a beverage station or bar instead of on a table near everyone keep people from overindulging and being full at dinner time! As I was planning this fall drink bar I collected all the elements together in the beverage tub and kept it in my study. It was so convenient to keep adding to it every time I thought of another thing I wanted on the drink bar. 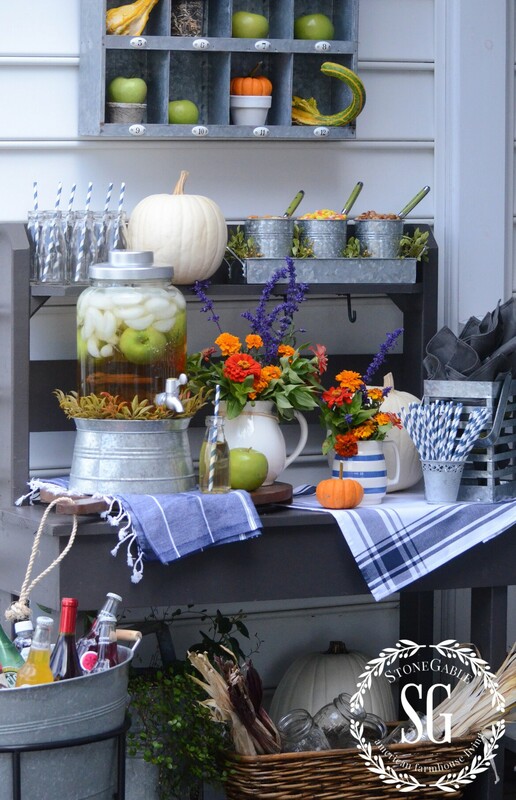 So, when it was time to set up my fall drink bar I brought almost everything outside in the beverage tub! Don’t you love easy-peasy? As the evening grows darker I’ll hang votive candles in mason jars on the little hooks at the back of the potting bench! 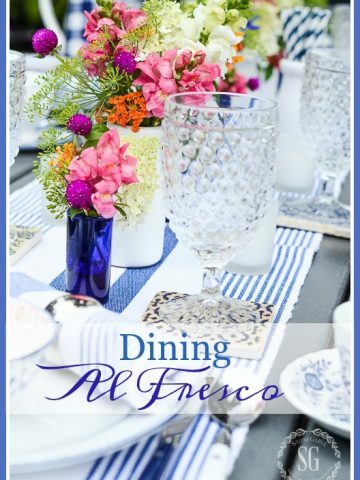 I hope I have inspired you and given you lots of ideas that you can use when entertaining family and guests! Remember to pin this to your tablescape, fall or entertaining Pinterest board. You can follow me on Pinterest by clicking HERE. I have been looking for a good punch for my Fall gathering this year. This sounds PERFECT! 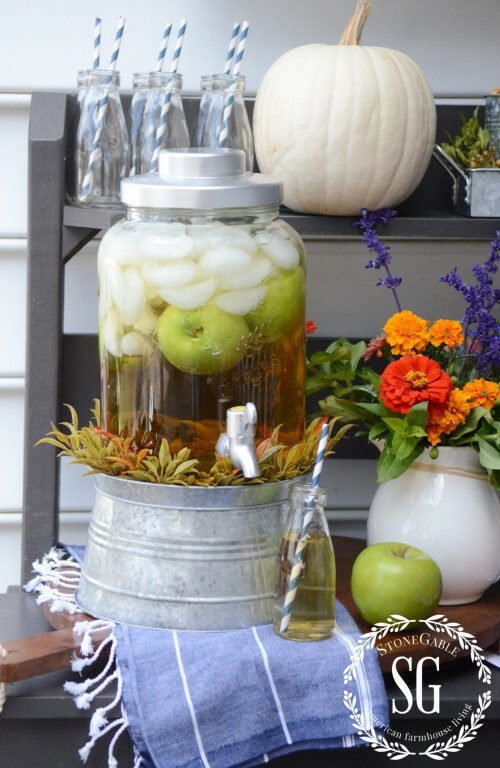 I want to try the apple punch for our October family party we have been having for 5 years! But this old girl don’t know how to measure parts! Would you please give me an idea on that? I love everything to do on your blog!! Keep it up! I am eager to try the punch! I love how you added the chunky ice cubes and whole apples to the dispenser, very eye catching! 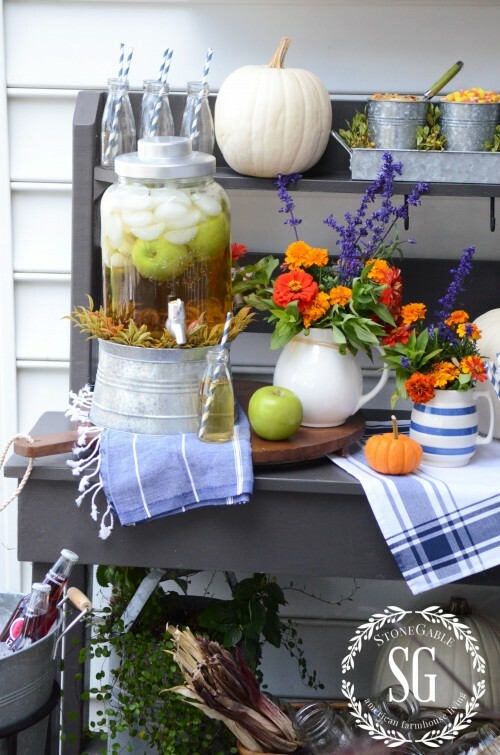 Makes me want to have a fall party! Seriously….you have the BEST posts for fall! Every single one makes me drool….love the recipe for the punch! Thank you for your amazing and creative ideas! Your beverage station look so inviting and pleasing to the eye. Love it all especially the the blue towels….thank you for the inspiration . 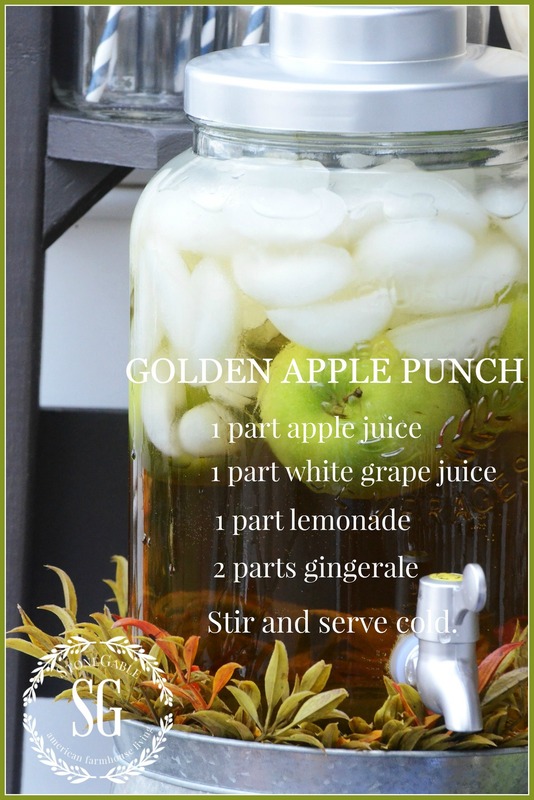 I had to Pin your recipe for the Golden Apple Punch. It sounds yummy. In Santa Barbara (California), eating and/or drinking outside is very pleasant in the fall. Sometimes, the summer is just a little bit too hot. Usually, the fall is mild – so it’s perfect for outdoor entertaining. Next, I heading over to Birch Lane’s website to get a few of the items from your post. Seriously! Everything you do is just ADORABLE! Thank you for the inspiration and encouragement, such fun following you little Ladybug! You are so sweet! It makes my day to know I have inspired someone! You are so creative! StoneGable is better than most home decor magazines I’ve seen. OMGosh Yvonne you are simply amazing! 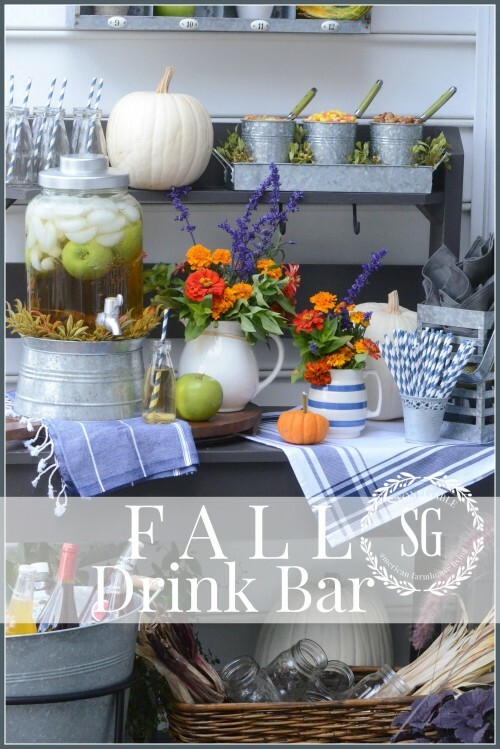 Your fall drink bar is stunning! What a feast for the eyes. 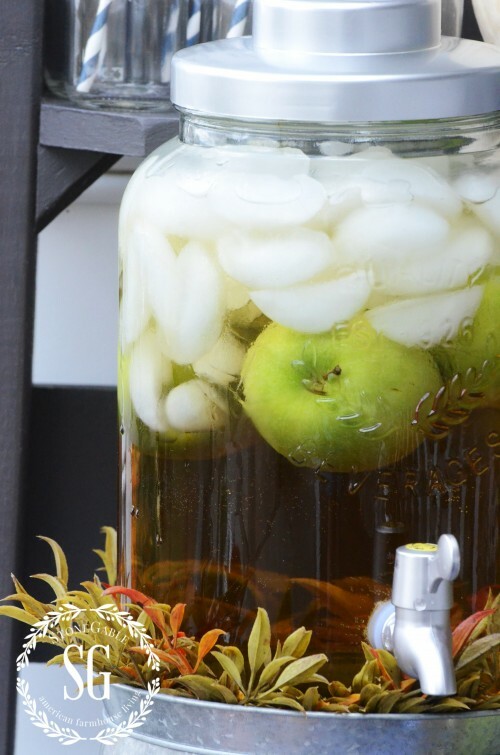 And the recipe for your apple punch looks delish. Will have to try that one out on my kiddies…they are fans of all the ingredients. Thank you so much for sharing your beautiful talent. I forgot you were moving your blog and I was wondering why I haven’t seen you in my dashboard with a new post. I guess I have to unfollow the old blog and refollow the new. Hopefully, I will be up to speed from here on out! I LOVE your Fall Beverage and Snack Station!! Do you happen to have a source list for the elements? I know you get tired of everybody asking for the sources. Haha I’d like to know where to find the tub with the stand and the other galvanized pieces you used if it’s not too much trouble. The colors of the flowers are fabulous with the blue and gray of the metals. Thanks for sharing it with us. You will love their products! Love the utensil caddy and the dairy bottles. Such a pretty beverage bar for autumn. Just so beautiful!!! Wow! You really outdid yourself. I love it!! 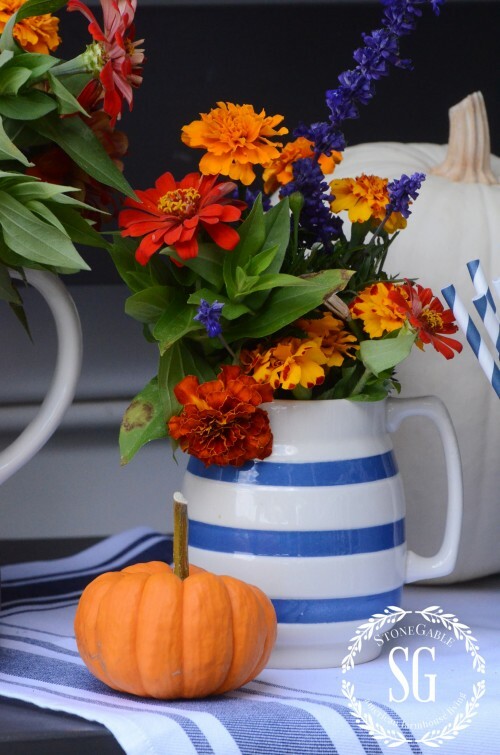 super fun and fabulous fall idea Yvonne! love the mini buckets full of goodies! That is so beautiful and functional! Love the tip about collecting all the items in the tub as you are planning it. Great idea! I will use that tip for years to come. Joy, that makes my day! I’m all about giving my readers great and helpful tips!!! Yvonne… I found your blog about 5 months ago and enjoy checking in each day. Your decorating talent is amazing and inspiring and your home feels so inviting and warm. You are my “go to girl” when I need ideas. Where did you get that adorable little “pig head” in your kitchen. Would love to find one. Beverly, So kind of you!!!! The online store that sold the pigs’ head (Earl Of StoneGable) is no longer in business! Sorry! Your drink bar and snack station features so many great accessories, you put it together so beautifully….love the fresh flowers!! Beautiful! Love the way you have set this up. So talented! What a gorgeous display. I love all the details. Yvonne, your drink bar and snack station are fabulous. You are the best at layering tablescapes. 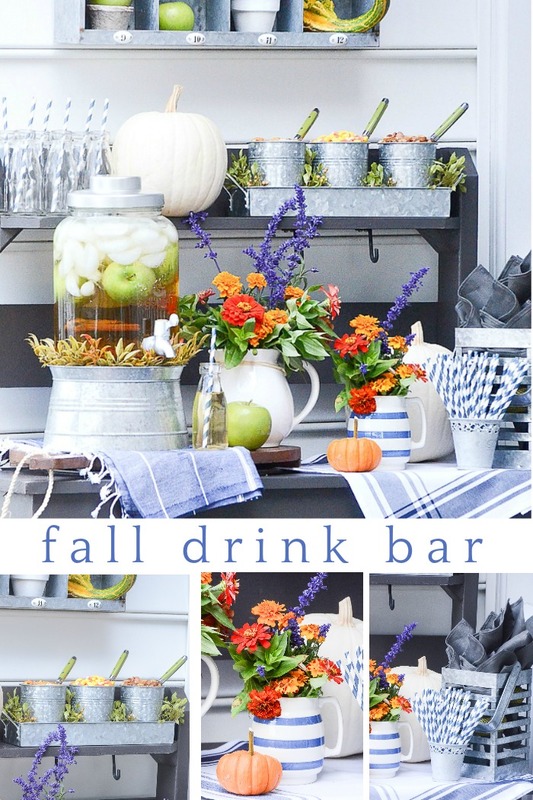 I have pinned so many of yours and I’m definitely pinning this fall drink bar. Your ideas are endless. Bring them on. You are one sweet lady. 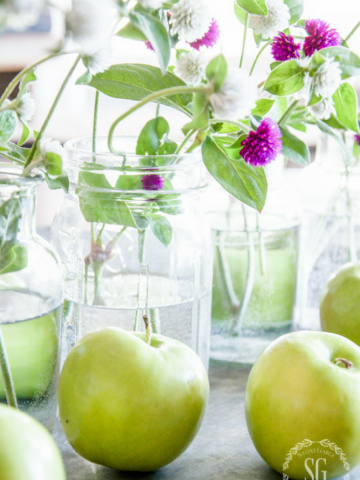 You should compile your pictures of your past tablescapes, vignettes, snack bars, etc. and compose a beautiful book. You know your loyal blog readers would support you all the way. Give it a try! I agree with a book idea! Beautiful beverage station! Gotta try the apple punch, looks very refreshing! Beautiful as always, Yvonne! 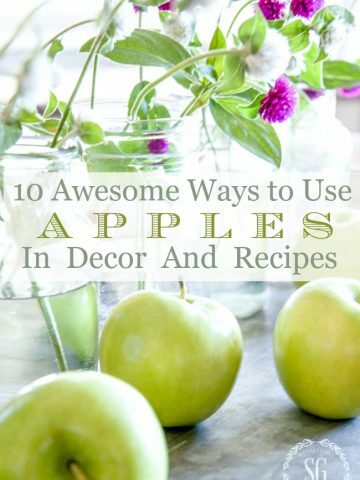 I love these ideas for fall decorating and entertaining. The way you layer things, amazing! It gives me so many ideas. Thank you for your beautiful, inspiring, and fun blog!!! It’s the highlight of my day. What great ideas, Yvonne! I will be sure to check out Birch Lane. I love all the beautiful fall colors. 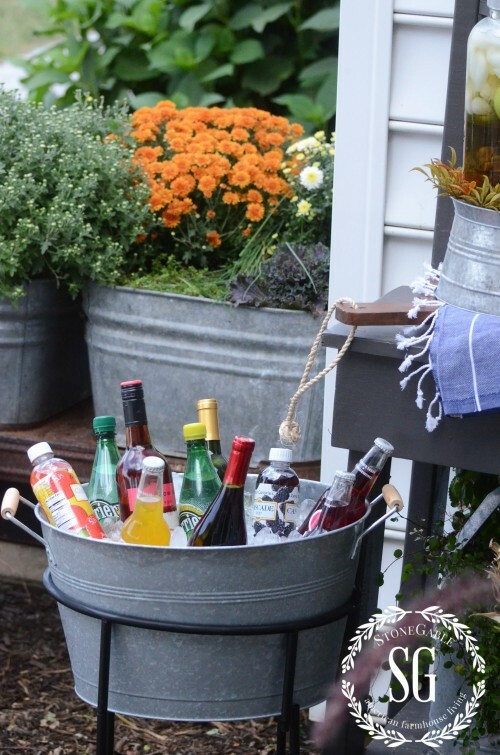 Using the galvanized buckets for snacks is so clever. You’re amazing! Sweet! I love how you turned your potting bench into a serving area. Something to keep in mind for my next backyard gathering. 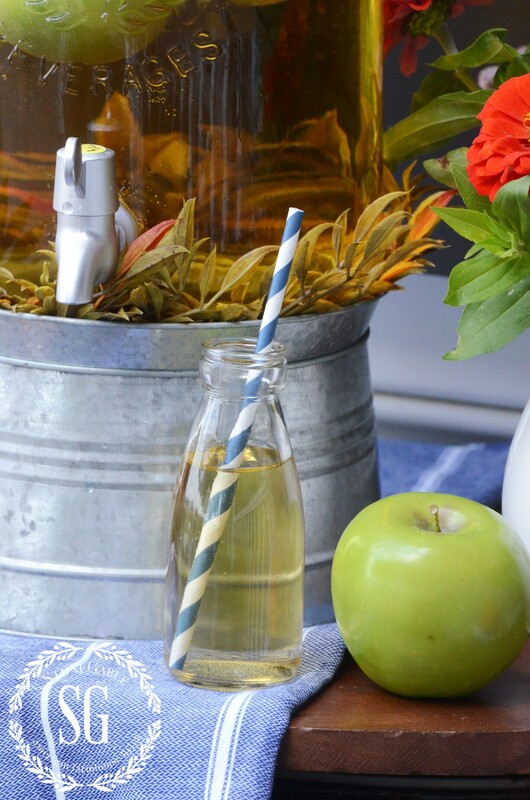 I love the drink station idea, and those little bottles are perfect for your apple punch. Setting up snacks away from the seating area (in those adorable buckets) is a good idea, too. People do tend to overindulge when the snacks are just a little too convenient. Love your corral of beverages.